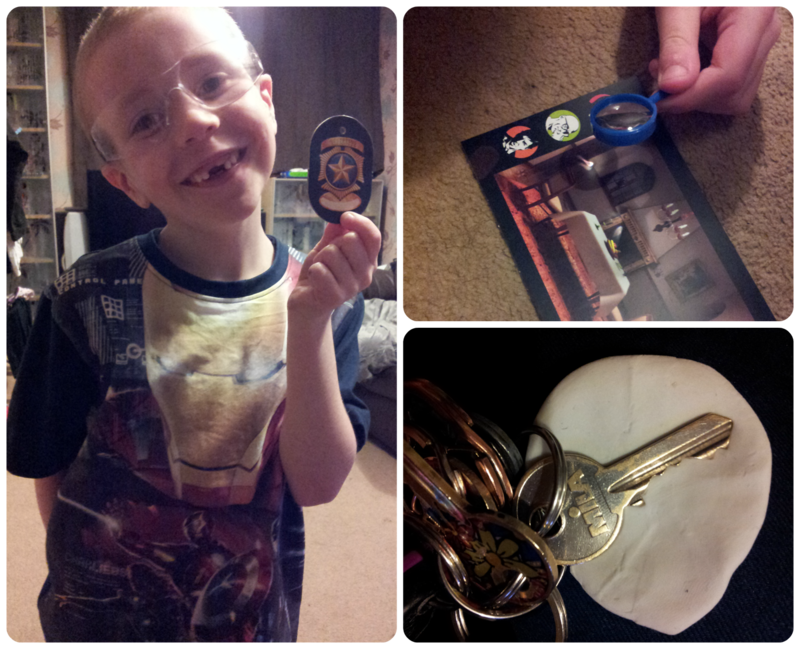 The Mini Mes love a bit of role play and anything that involves wearing glasses or detective work so the Science X CSI set from Ravensburger was great; they got to be investigators! 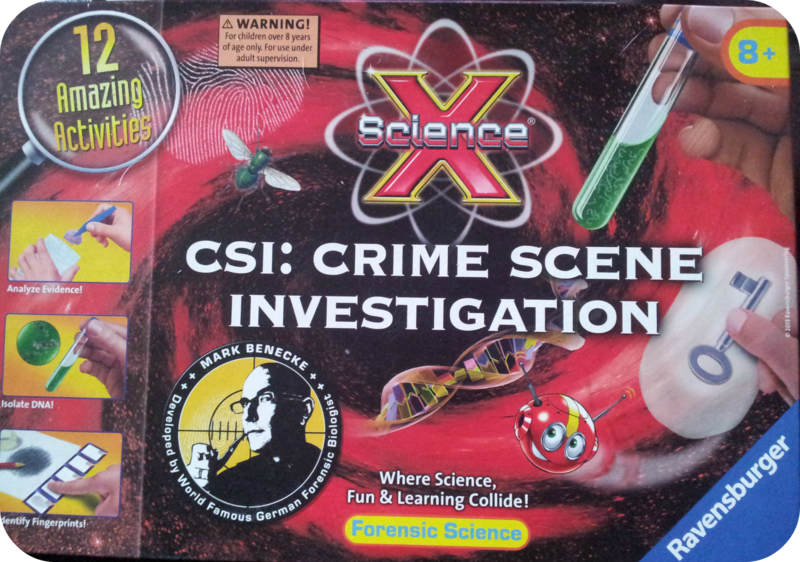 The Science X set is fun yet educational as it helps your child to learn about science by solving simple mysteries. The Mini Mes became forensic experts by using scientific methods and investigating clues which they really enjoyed. 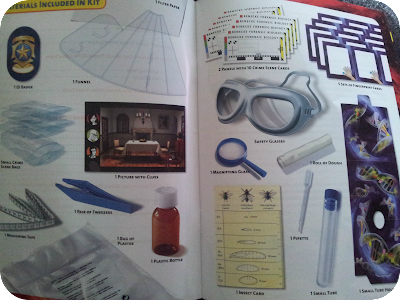 There are 12 activities to try which are explained within the booklet provided, in lots of details and with pictures, which include taking finger prints and shoe prints, making copies of objects, analysing drops and measuring. Each different activity is fairly simple to complete although quite a few other household materials are required for some of them and adult supervision. There is a nice variety of things to do and the ID badge was good to have included although we would've appreciated another one and extra goggles to prevent quarrels! The first activity we completed was taking fingerprints. We have been to a few police open days before where the Mini Mes have done this so they were keen to give it a go at home. Each person uses a pencil to colour in a small patch on a piece of paper. After applying a small amount of hand cream and wiping hands dry on a towel they place their fingers onto the pencil so the colour transfers onto the skin and then place them onto the fingerprint cards, labelling them on the reverse. You can have someone play detective and try to work out which belongs to who! Next we used my keys and various coins to copy using the dough. You can make plaster copies by pouring some into the prints if you wish. The booklet is packed with tips from professionals which explains that locksmiths used to make and file a key using this method but not many do these days. The Mini Mes found this interesting and liked looking for different textured objects to copy. Next Minxy used the magnifying glass to look closely at images of a room before and after a crime occurred. She had to use her skills to pick out the changes in the room to help work out who had committed the crime. To the back of the book there are the answers to the tasks a notes page and a handy section on the terms used to help explain what different words mean throughout the booklet. Launched at Toy Fair 2013 the CSI kit has a RRP of £16.99 which I think is about right for all of the items included and the fact that the kit will keep little ones busy for some time. It's not something you will probably do all of in one day so it would be great for National Science and engineering week (15th-24th March) or for the fast approaching Easter break. There are several other products in the range which include magnetic magic, crystals and gemstones and electronics and circuitry. My 6 year old would love this, and I have to admit I think I would too! My boys would love this too! My nephews have this and now my boys are green with envy!